The Boeing 747, which turns 50 this Sunday, slashed airfares like no other plane in history, since the Douglas DC-3, to make travel affordable for all. The incredible DC-3 was the first plane that was able to make money just hauling passengers and freed airlines from restrictive mail contracts, while the 747 freed the world’s population to travel wherever they liked. Bill Gates said that the 747 was “the world first world wide web” as is smashed barriers between people and countries. 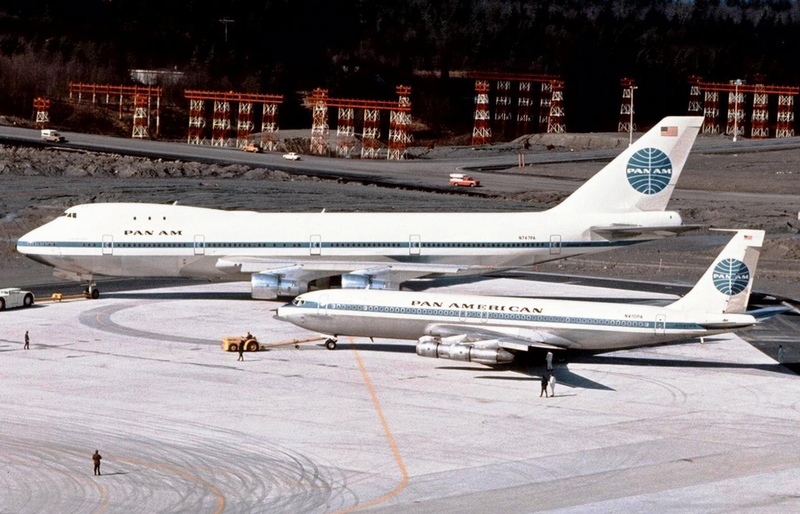 In fact, when the sponsor of the 747 Pan American World Airways’ President Juan Trippe took delivery of the 747, he said we are in a race between the 747 and the ICBM (Intercontinental Ballistic Missile) and he said I believe the 747 will win. When the 747 was introduced in 1970 the airfare from Australia to London and return was the equivalent of 24 weeks average weekly earnings for an Australian. By 1990 it was about five weeks average weekly earnings and by 2000 two weeks. Today it is below one week’s earnings. 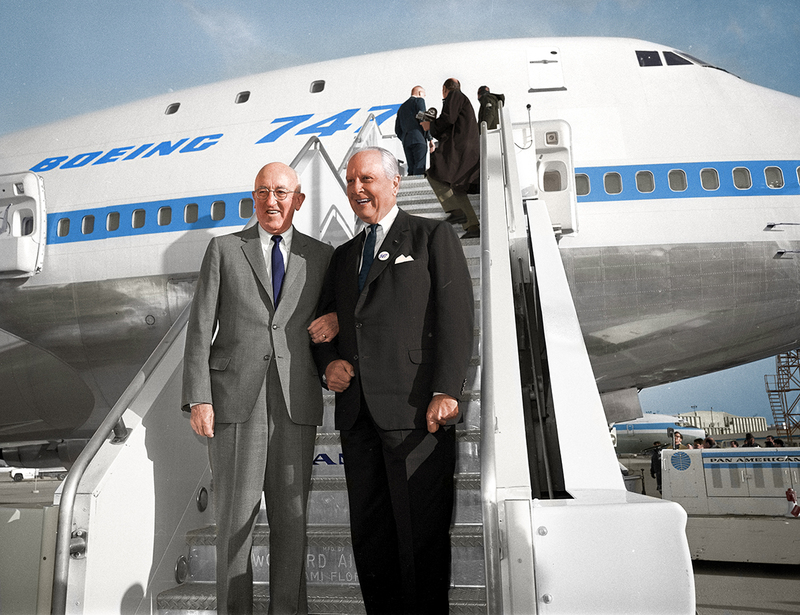 The 747 was a mass travel dream of Trippe and Boeing’s chief Bill Allen. Trippe had started mass travel in 1948 when he introduced economy class onto 70 seat DC-4s. 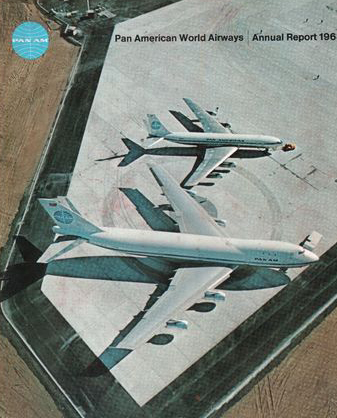 Pan Am annual report showing the difference in size between the 747 and 707. The secret was the new high bypass engines that could produce over twice the thrust of the existing engines could do it at the time. At the time the most powerful engine on the 189-seat Boeing 707 or Douglas DC-8 produced 19,000lbs of thrust, whereas the 366-seat 747-100’s engines would produce 43,500lbs of thrust. 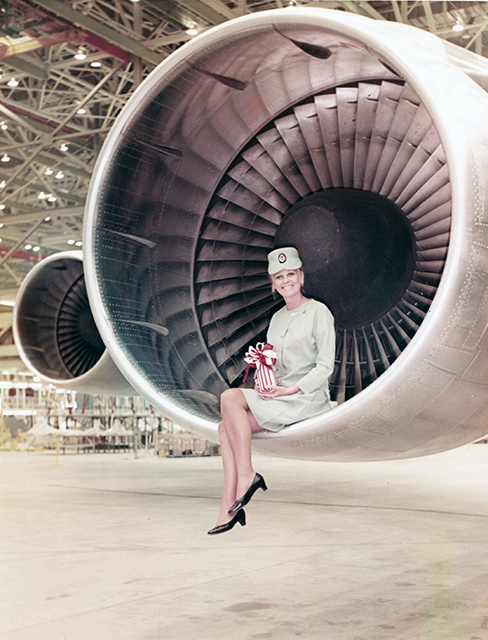 A Pan Am Hostess in the engine of a DC-8. But that was only part of the story with fuel economy the big ticket. The 747-100 used 33 percent less fuel than the Boeing 707-320C it would replace. However, that was just the start. When Boeing first delivered the 747, economy class was in a generous configuration of 2-4-3 with up to 10cm more legroom that today. 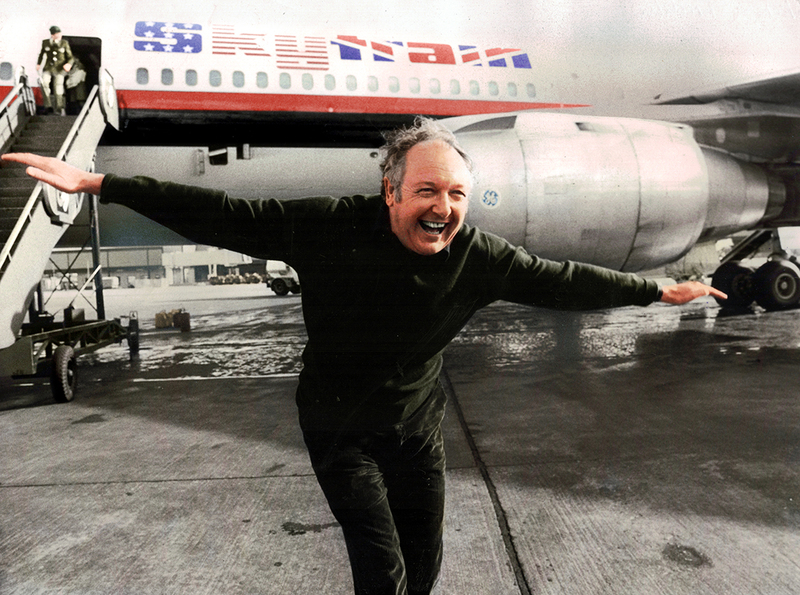 Sir Freddie Laker with his “no frills” Skytrain DC-10 jumbo flights were to change all that. He slashed fares by two-thirds across the North Atlantic in 1977 and he had applied to fly to Australia and Hong Kong. Airlines responded by cramming more passengers into their 747s and DC-10s to cut fares. That move spawned both business class and then later premium economy classes as airlines sought to cater for all pockets and desires for space. But for the 747, the same engine technology that would enable it to dominate the world’s air routes was also going to be its undoing. As engines became more fuel efficient and reliable it enabled aircraft manufacturers to develop aircraft like the 365-seat Boeing 777 and the 300-seat Airbus A330 which slashed fuel used per passenger dramatically. 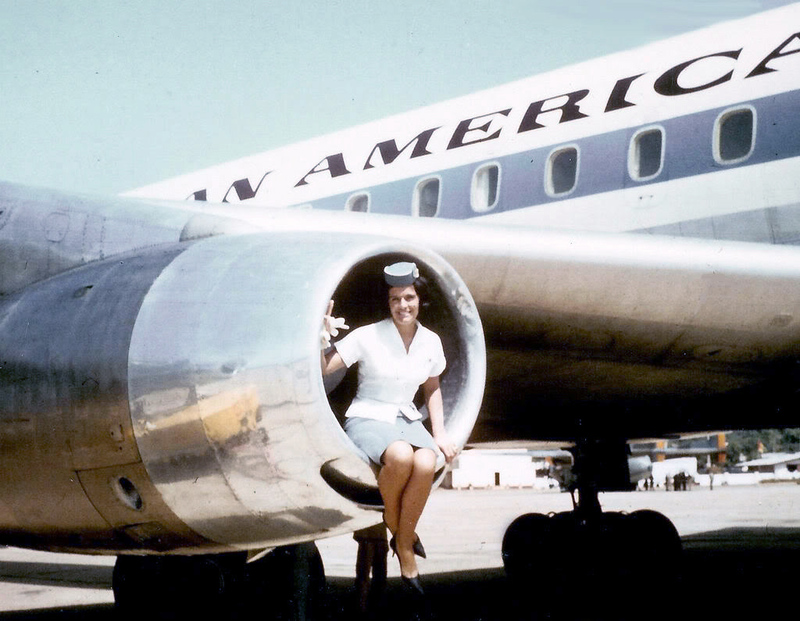 And they were much easier to fill than a 747. Compared to the first 747, the Boeing 777-300ER cut the fuel burnt per passengers by about 35 percent, while the Boeing 787-9 is almost 50 percent more fuel efficient per passenger. And the new Boeings and Airbus A350 can fly much further than a 747.